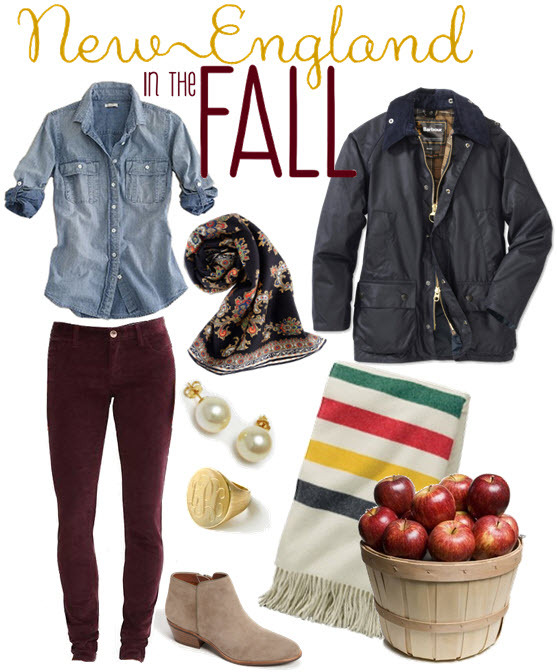 It's that time of year again, FALL! Even though it's 80 degrees outside today and it doesn't feel like it, September is finally here. While I am sad to see Summer go, I am excited for everything that Fall brings. The leaves changing, cooler temperatures, pumpkin pies, and apple picking! I cant wait to head out to the country and go apple picking, its just one of those traditional New England things that everyone has to do at least once. I, on the other hand, like to go at least once a season. A Barbour jacket is #1 on my list! yay for new england fall..can't wait for apple picking as well. really like those booties! So cute! I love all of that! I want to go apple picking! I need that scarf like, yesterday. Great outfit! Ah, the iconic Pendleton blanket. It doesn't get much more New England than that! Love the Chambray Shirt & Skinny Cords the boots! Come on Fall! oh i want a Barbour coat more than ANYTHING!